This station drill is really for younger players from ages 8 to 12. It is a very simple drill that emphasizes forehand shooting fundamentals. The setup of this drill forces players to keep the puck back in their stance, keep thier head above the puck, and use a good weight transfer throughout the shot. Many players at this age will push, or shovel, the puck from the front of their body which causes them to lse a lot of power. A lot of the good shooters, especially Russian players, start the shot with the puck behind them. The video here of Connor McDavid is a great example if starting the shot from behind the feet. To set up the drill place a pad about 20 - 25 feet in front of the net as shown in the diagram. The coach will have all of the pucks right in front of the pad. It is important to have the left handed players in the line on the right and the right handed players in the line on the left. 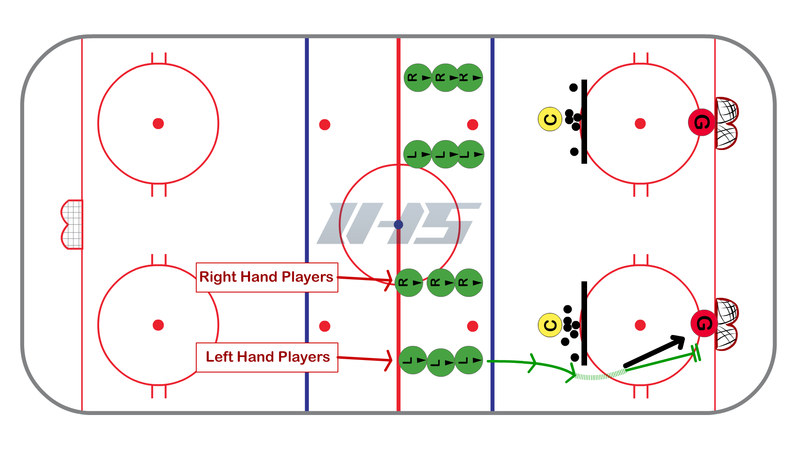 The coach will set up a puck just on the edge of the pad so that as the player skates by they have to pull the puck slightly towards them, around the pad, and then continue the motion into the shot. This will help keep the puck behind them as they start the shooting motion. pull the puck slightly into the body. transfer weight as you shoot. keep the head over the puck. do not lean back, all the motion should be going to the net. encourage players to shoot low and hard so they are not leaning back.